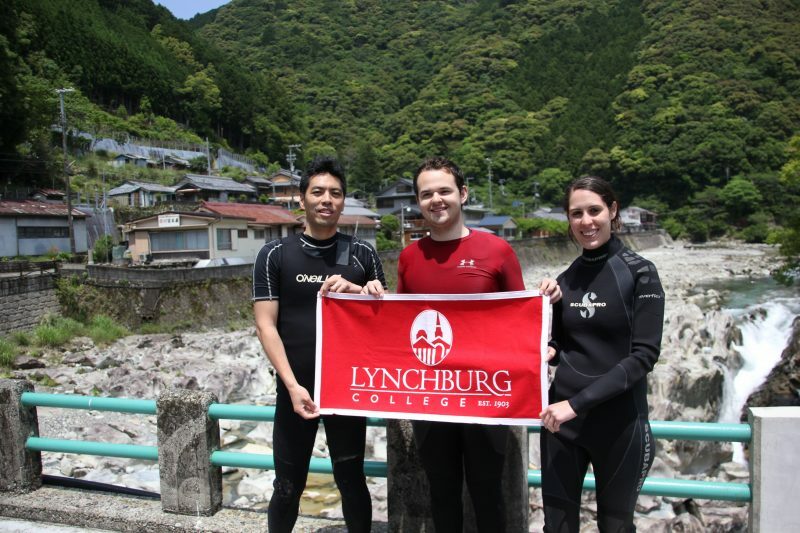 Biology professor Dr. Takashi Maie and two students traveled to Japan last month to experience the country’s culture and also study the goby fish, an “evolutionary marvel” known for its ability to climb waterfalls during upstream migration. Ben Giustiniani ’18, Kierstin Reid ’17, and Dr. Maie studied bioethics and also visited many historic sites in Japan. They experienced the metropolis of Tokyo, the sacred shrines in Kyoto, and the pristine beauty of the Kushimoto, Wakayama area. “My goal of this trip for students is to help them develop self-awareness, cross-cultural competencies, lasting memories, and life-long connections with Japan,” said Dr. Maie. While in the Wakamaya area, Dr. Maie led a field research project in which he and the students dove to collect goby fish. After scouting an area downstream from the Takinohai waterfall in the Koza River to ensure safety, Dr. Maie and his student searched the water for the fish. The water was shallow, but the current was strong. “That’s what this goby likes,” Dr. Maie said. After catching enough goby, they took the fish to Tokyo for further study.